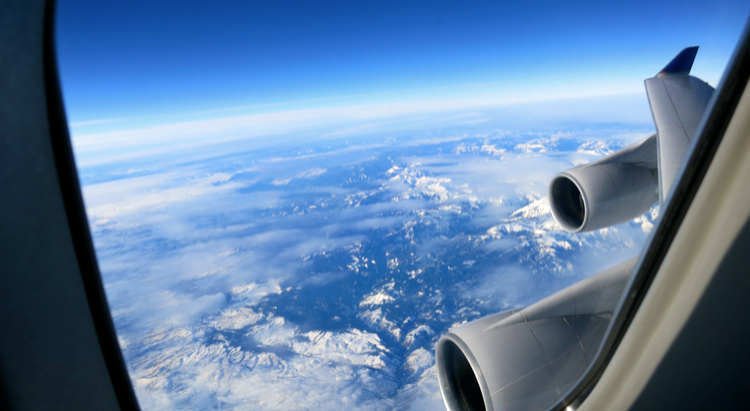 Are peak season airfares getting you down? Don’t fret! Here are my five secret steps for finding the best fare home for the holidays… or any time of year for that matter. One bit of good news right now? Airfares are trending down due to lower fuel prices and overcapacity. These trends will be magnified over the next few weeks as we enter the slower “dead weeks” of early December and early January when airlines roll out deals to help keep all those planes full. The dead weeks are one of the best times of year for those with schedule flexibility to check around for last minute fare deals– or last minute “deals” on frequent flyer mile redemptions. Also, business travelers can take advantage of last minute deals to get some all-important face time with clients who might have been avoided due to expensive fares. Keep an eye out for upcoming Black Friday or Cyber Monday sales for dead week deals. For example, Delta has just deeply discounted SkyMiles redemptions for a Black Friday sale. 1) Determine the “going rate” for the trip on the dates that work best for you– and keep in mind that Tuesdays, Wednesdays and Saturdays are generally the cheapest days for flying. Shop for fares on your airline of choice and also on fare comparison or shopping such as Google Flight Search or ITA Matrix– these are considered the best search tools because they are not involved in manipulating results on behalf of advertisers. And don’t forget to check Southwest.com since Southwest fares don’t show up on most comparison sites. 3) Set up fare alerts for price drops— fare shopping sites such as SkyScanner, AirFareWatchDog, Kayak or major online travel agencies will do this for you. Based on your research of the “going rate” set a fare level that feels comfortable for you (based on demand), and you’ll get an email if the fare drops below that. Don’t forget to include all the airports near your destination– some can be significantly cheaper than others. 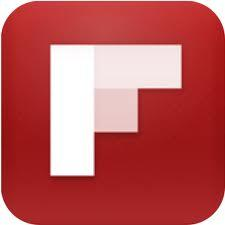 4) Once you see a fare that fits into your budget and timeframe, BUY IT. Feel good knowing that you snagged a good seat on a convenient flight at a reasonable price. Don’t sweat it. By waiting, you’d likely not find the most convenient flight for you. Convenience is worth paying for. What’s your best tip or experience getting low fares? Leave it in the comments! The crazy Thanksgiving peak travel week is almost upon us; it can be a great time for reuniting with family and friends back home, but it can also be a time of travel trauma when you’re actually trying to get there. Overall, travelers, the airlines and airports seem to have gotten the Thanksgiving travel drill down in recent years. When everyone plays by the rules and the weather cooperates, everything goes pretty smoothly and there’s a collective sigh of relief and a “well that was not so bad after all” when it’s all over. Hopefully that will happen again this year. Did you think Thanksgiving travel was crowded and hectic last year? Well, in 2016, according to the airline trade organization Airlines for America (A4A), you can expect to see 55,000 more passengers per day than you did during last year’s Thanksgiving holiday period. “Highly affordable air fare is driving that increase,” A4A said. Airlines have bumped up capacity to handle the extra loads. U.S. airlines expect to carry an average of 2.27 million passengers a day during the Thanksgiving period, which A4A defines as the 12 days from Friday, November 18 through Tuesday, November 29. Thanksgiving is Thursday, November 24. The group said it expects the busiest travel days to be – in descending order – Sunday the 27th, Monday the 28th, and Wednesday the 23rd, with the lightest travel, as usual, on Thanksgiving Day itself. But the travel search engine Skyscanner looked at its data and came to a different conclusion: It predicts the busiest day for air travel will be Saturday, November 19, “with travelers taking advantage of the short workweek to get away for a longer period of time,” said Randi Wolfson, the company’s communications chief for the Americas. And where will it be the busiest on that day? 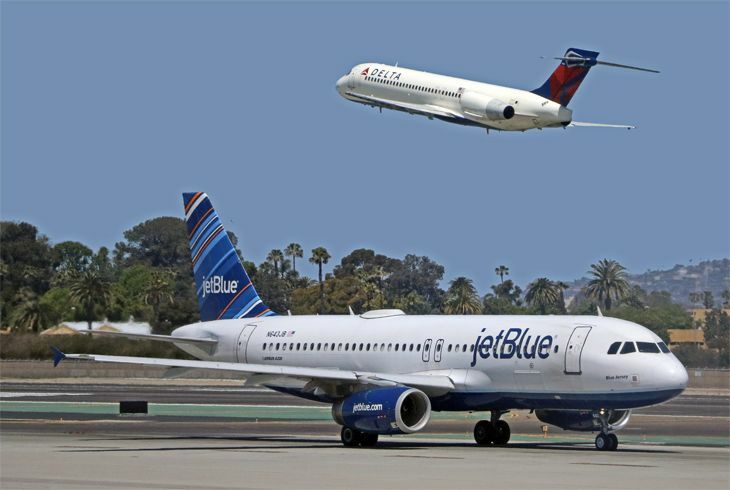 Skyscanner predicts that passenger traffic will hit levels three times or more above average at New York LaGuardia; Washington Reagan National; and Orange County, California’s John Wayne Airport. Traffic is expected to be twice the usual level or more at both Chicago airports, all three Bay Area airports, Miami, Ft. Lauderdale, New York JFK, Newark, Philadelphia, Dallas/Ft. Worth, Los Angeles International and Burbank. Another take on holiday travel trauma comes from Milecards.com, which conducted a study of airline cancellation rates over the holidays during the past six years at the nation’s 50 busiest airports. Its main conclusion? 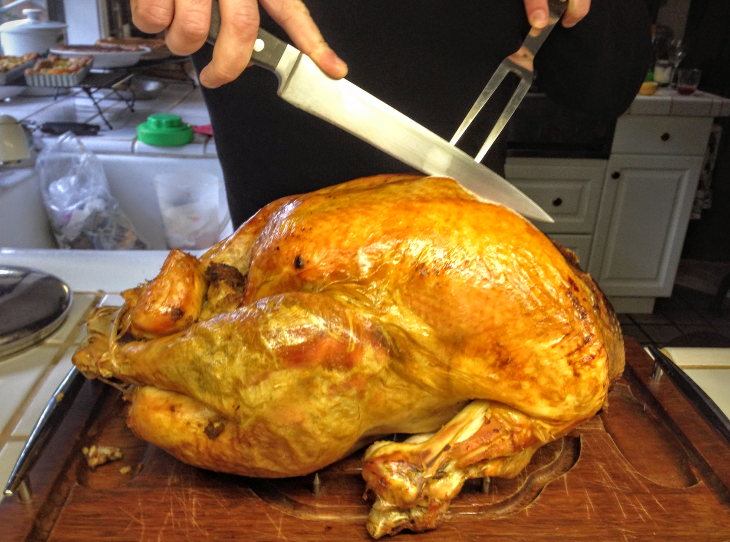 “If you have only one holiday to choose for a flight home, make it Thanksgiving” instead of Christmas, Milecards said. Why? Because the flight cancellation rate around the late December holidays is five times greater than at Thanksgiving – 2.1 percent of all flights vs. 0.4 percent. The days when your flight is most likely to be canceled are December 26 and 27, the company said, while the best odds for avoiding a cancellation are on December 23 and 24. The worst holiday-period cancellation rate is at Newark Liberty International – almost three times the national average, and it’s worse around Christmas than Thanksgiving, with a cancellation rate of almost 6 percent. 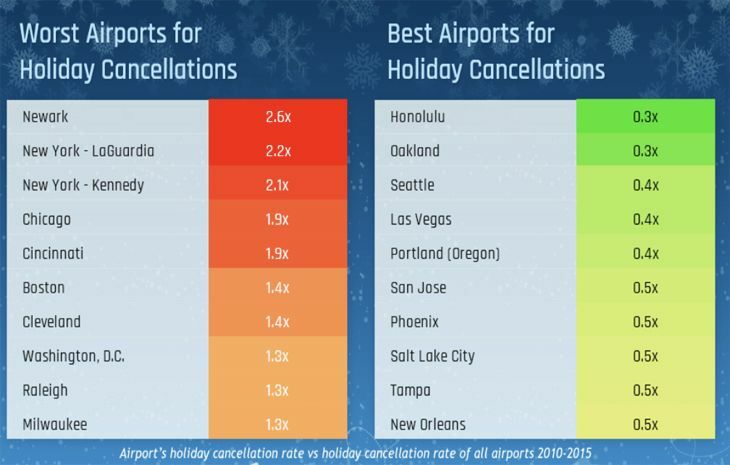 Airports with the lowest cancellation rates around the holidays are Honolulu, Oakland and Seattle, while the lowest rates for major connecting hubs are at Salt Lake City and Denver. Milescards found that cancellation rates are much higher for shorter flights, such as San Francisco-Sacramento, than for longer flights such as transcons. 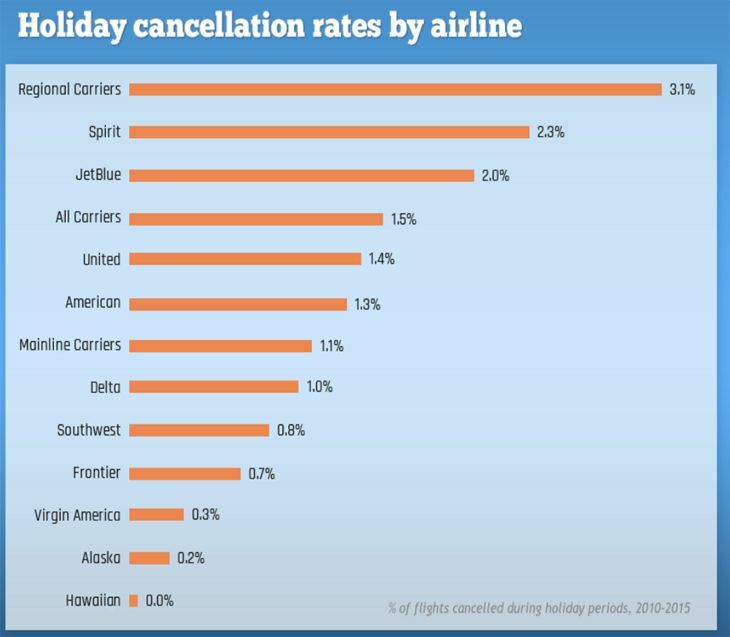 You can see several charts here documenting the findings of Milecards.com’s holiday flight cancellation study. I’m staying put in San Francisco for Thanksgiving this year, with our feast just a short drive away. What about you? Will you brave the skies this year?